So Pickin' Cute (Continued): Finally. Fabric! Hellooooooo! I have missed you terribly. Since my blog break, I have found myself constantly thinking, "man...this would make a great post". I received some adorable cupcake-ish items for my Birthday this year, and it about killed me to keep them to myself! Then, I found another little bakery in town with a bathtub-sized cupcake on the roof. (That might be a slight exaggeration - but it's pretty darn big!) I am waaaaaaaaaay behind on reading my favorite blogs, and definitely need to build up my inspiration photo folder. 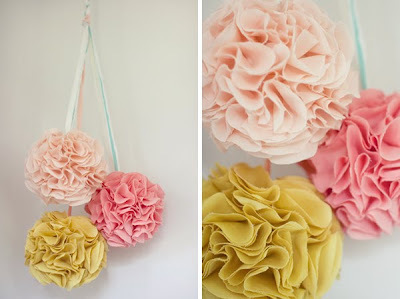 However, I did find this tutorial on making fabric pom-poms the other day. 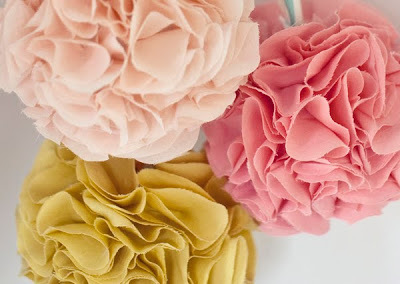 I know we had a little discussion about the durability of the tissue paper version, so I thought you might be thrilled about this DIY project. I would love to hang some in Kalia's playroom. Where would you hang them? Abby! Please say you're back...at least a little bit more on the regular?! Those poms are so cute! Adorable in a girly room!